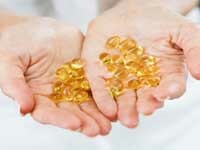 Fish oil supplements may help to preserve the sanity of people on the edge of psychosis, a study suggests. Researchers found that individuals at high risk of suffering a serious psychotic episode were less likely to develop symptoms after taking fish oil capsules containing omega-3 fatty acids. The explanation may lie in the way omega-3 is believed to affect the structure of cell membranes in the brain and improve connections between nerve cells. The oil may provide a promising new way of helping schizophrenia patients, who could suffer from poor fatty acid metabolism, say the Austrian scientists. The researchers identified 81 people at very high risk of experiencing psychotic disorders characterised by delusions, hallucinations and confused thoughts. These were individuals who either had mild psychotic symptoms, were suffering from a short-lived "transient" episode of psychosis, or had a family history of psychotic disorders. Up to 40% of people in this category will become fully psychotic in the course of a year. For 12 weeks, 41 of the group were randomly assigned to take daily fish oil capsules containing 1.2 grams of omega-3 fatty acids. The remaining 40 were given a placebo. By the end of the study, two patients in the omega-3 group and 11 in the placebo group had become seriously psychotic. Those taking the supplement were 27.5% less likely to progress to this state than those who were not. Omega-3 also appeared to reduce psychotic symptoms significantly and improve mental functioning compared with the placebo. The Press Association has contributed to the report.